Claude Giroux is still the postseason points and goals leader, despite being eliminated two weeks ago. Last week he had surgery on both wrists—bone spurs in one, torn cartilage in the other. That didn't stop him from tearing up Philly over the weekend, an odyssey nobly chronicled by Crossing Broad. 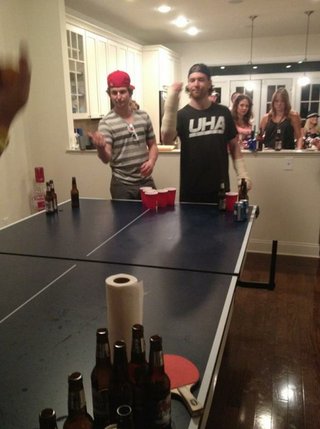 Sunday night ended with Giroux having some people over for beer pong, and he was not noticeably hampered by the soft casts on both arms. He's a gamer.